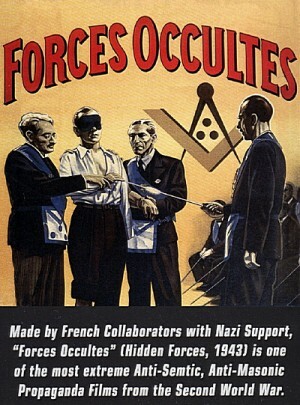 Made by French Collaborators with Nazi Support, "Forces Occultes" is one of the most extreme Anti-Semtic and Anti-Masonic Propaganda Films from the Second World War. Echoing racist stereotypes dating back to the nineteenth century, contemporary propaganda, and a wide range of repressive measures instituted by both the Nazis and the Vichy government, the film revives the paranoid conspiracy theory that a secret, international network of Freemasons and Jews controls world politics and economics. A docu-drama that cloaks fiction in the narrative conventions of true documentary, and ideologically motivated persecution in the guise of scholarly objectivity, Forces Occultes places spectators in the role of a naive initiate — the young legislator Pierre Avenel — who at first believes in parliamentary democracy and the Masons, but gradually discovers the “truth” and is brutally attacked when he threatens to expose it. 1 Historical Context & Production Information. 2 Content Analysis, Distribution Reception.